EUROPE’S elite band of clubs has continued to sweep-up across the continent, with the exception of England, where one of the biggest shocks of all time saw Leicester City secure their first ever Premier League title. Whether Leicester’s triumph, or the growing democracy in the Premier is a one-off, and that normal service will be resumed in 2016-17, remains to be seen. But there is a strong feeling that the overall wealth of the English league is changing the dynamic. In 2015-16, Tottenham and West Ham have moved up a level and the heavyweights of Arsenal, Manchesters City and United, Chelsea and Liverpool have all endured disappointing seasons. Actually, England has been more democratic than the other countries from the “big five”. Over the past six seasons, there have been four league champions: Manchester United (x 2), Manchester City (x 2), Chelsea (x1) and now Leicester. Not since the early 1970s (1970 – Everton; 1971 – Arsenal; 1972 – Derby; 1973 – Liverpool; 1974 – Leeds United; 1975 – Derby) has the top level been so “open”. Likewise, the FA Cup over the past six years has been won by four teams – Manchester City, Chelsea, Wigan Athletic and Arsenal. The final this year is between Crystal Palace and Manchester United, another example of an unlikely club (Palace) coming to the fore. Elsewhere, Europe’s top leagues are being dominated by either individual clubs or a cartel of two or three. In France, Paris St. Germain’s enormous wealth has brought them four consecutive Ligue 1 titles and a possible second successive clean-sweep treble (Ligue 1, Coupe de France and Coupe de Ligue). PSG’s overwhelming stranglehold on French football has yet to translate into European power. It’s a similar story for English clubs like Chelsea and Manchester City, who have been transformed into super clubs by virtue of inflated investment. Chelsea, of course, won the UEFA Champions League (UCL) in 2012, but in the past few years, they have declined in Europe. City have yet to get there, and their tepid displays in the UCL semi-finals against Real Madrid underlined there is still a significant gulf between Europe’s very top clubs and the challengers with high hopes. Certainly, being cast in the role of “flat track bully” does not seem to benefit PSG, who need greater competition at home in order to keep their team stimulated and also to benchmark how good they may or may not be. In England it’s different, but once the Premier’s top clubs go into Europe, they have developed a habit of under-performing. To some extent, Juventus are in a similar position, although Juve, who have clinched their fifth consecutive Serie A title, reached the UCL final in 2015 and they do have a stronger European pedigree than PSG. Juventus have won eight of 11 main prizes in Italy over the past six seasons and they could make it nine from 12 if they win the Coppa Italia on May 21. The rebirth of Juve comes at a time when Italian football is struggling to live up to its past. Juve are arguably the country’s only short-and-medium-term hope of producing a credible European force. The current Serie A campaign underlines how weak the field is, with a number of clubs vying for leadership as Juve floundered in the early months. That Juve were allowed to come through the pack and are now comfortably in charge once more demonstrates the lack of competition for the Turin side. Germany has the same problem with the Munich monopoly. Bayern are poised to win their fourth consecutive Bundesliga title, but Borussia Dortmund have come again after trailing off in the last two years of Jurgen Klopp’s reign, which bodes well for next season. In the meantime, the two clubs will meet in the DFB Pokal final on May 21. Bayern will start 2016-17 with a new coach in Carlo Ancelotti, who will be expected to win the UCL, something that Pep Guardiola failed to do in his three years at the Alianz. For the second time in three years, the UCL will be an all-Spanish affair – which means that the trophy will stay in Spain for the third year running. For so long, throughout history, Spain’s La Liga has been a two-horse race between Real Madrid and Barcelona, but Atletico Madrid have moved into the super club bracket after a three-year period that has made them solid challengers to the big two. While this may not be sustainable, the fact they have won La Liga in an age when Barcelona and Real Madrid have had the likes of Cristiano Ronaldo and Lionel Messi in their line-ups, was a major coup. Equally impressive is that after winning La Liga in 2014, Atletico lost a number of key players – e.g. Courtois, Costa – but rebuilt and now have some of Europe’s most coveted players. Two UCL finals in three years demands respect and Atletico are now being tipped to win the competition for the first time. And the La Liga title race could still go anywhere among the top three. 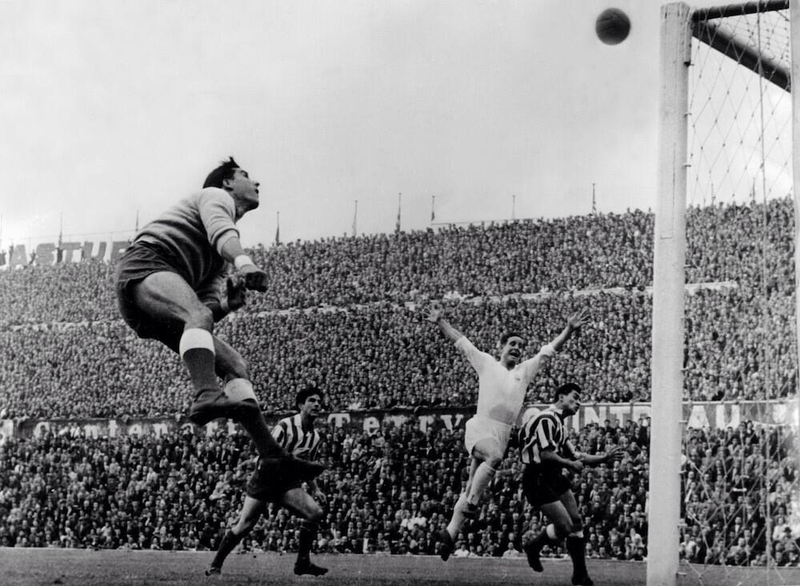 If Atletico can now be classed as part of the upper quartile of Europe, clubs like AC Milan, Inter and Liverpool, all of whom were once part of football’s royal family, cannot. Likewise, Arsenal’s record in recent years – just two FA Cups – keeps them among England’s top drawer but not necessarily among Europe’s very top bracket. In a few years’ time, clubs like Chelsea and Manchester United may struggle to maintain that status. As it stands, though, a group of 10 clubs – Barca, Real, Atletico, Juve, Bayern, City, United, Chelsea, PSG and Dortmund, have supplied 17 out of the last 20 UCL finalists. They’ve also won 26 out of the last 30 league titles from the hallowed pentagon. That’s what makes Leicester City’s Premier League success so utterly therapeutic and why Atletico Madrid’s return to the UCL final is to be welcomed. It shows that, despite some clubs having unprecedented wealth, there is still an element of unpredictability in the game. Hurrah for that.